. 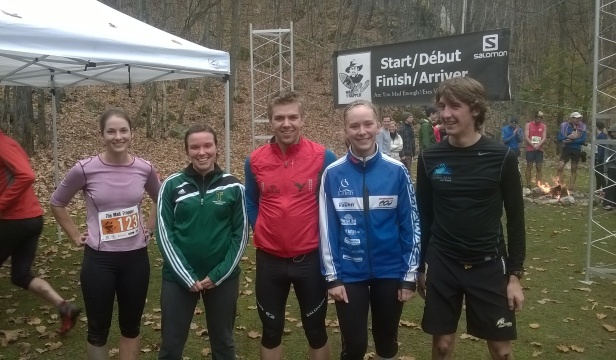 : The Relentless Trail Race at the Ark :: Ski XCOttawa.ca :: Skiing in Ottawa and Gatineau Park :. This past Saturday Katie and I, along with a few Carleton athletes and lots of other keen trail runners, ran the Relentless Trail Race in Low, Quebec. I write this article mostly as a plug for the event, because it is a great one! It includes 5.5, 10.5, 21, and 50km race distances, all on tricky single track trails. The race is muddy, hilly, and a lot of fun! Food seems to be another enjoyable theme at the Ark. Saturday's event was followed by homemade brownies, beer, and other yummy snacks. Mike also mentioned a snowshoe race in early January which concludes with a lunch buffet among fellow racers. The Pancake Prediction Run is another event to look for in April, which includes a pancake breakfast and the Ark's own maple syrup. According to their website, the Mad Trapper mission is to "provide the most unique and challenging courses our terrain can provide" while at the same time, they "prioritize participation over competition". If you ask me, Saturday's race was a good example of what happens when people embrace their passions and let their efforts follow - for the racers, but even more so for the organizers. Me, Sarah Murray, Matt Brown, Katie, and Ben Dearing shortly after our races. My spikes before and after the race - muddy mission accomplished. Race Report: Long Lake Triathlon!